Wow... The past couple of days have been beautiful here in central PA. At my place there has been a whole lot of sun, t-shirts, flip-flops, birds in the lawn, growing grass (Booo! Hisss!) --all of the wonderful things that we associate with Spring. Without a doubt Spring has definitely sprung, lol. 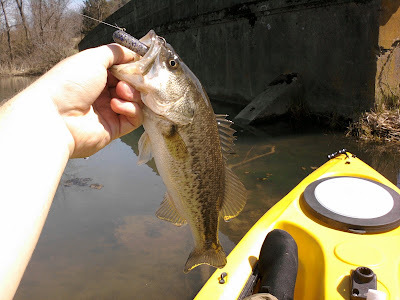 Recently, one of the unfortunate side effects of Spring (for us PA smallmouth anglers anyway) has been the fluctuating water levels in our local rivers. In fact, I just had the past two days off of work and would have loved to have hit one of the local rivers for some fun-in-the-sun, smallmouth action.. But, it just wasn't in the cards for this past week. Still, the rivers aren't the only game in town in central Pennsylvania. We have some beautiful local lakes as well, and this time of the year they are waking up quite nicely. 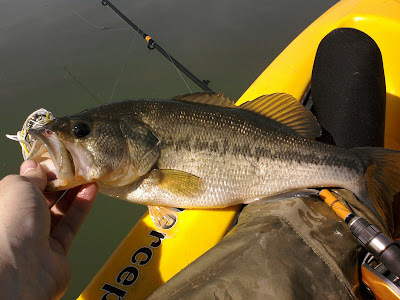 So, when I was desperately taking a break from deciding whether or not to mow the lawn this afternoon, I took a couple hours to splash my kayak in a local lake and hopefully chase down one of those 'other' types of bass. I had a great time on the lake, and although fishing wasn't fast and furious, it was successful. I paddled around, heard a turkey gob ble, did some exploring, some bird watching, some turtle watching, and engaged in some pretty serious fishing for a couple of hours. In the end, I landed three largemouths (one particularly nice football shaped bass--around 17 inches) and a brook trout. 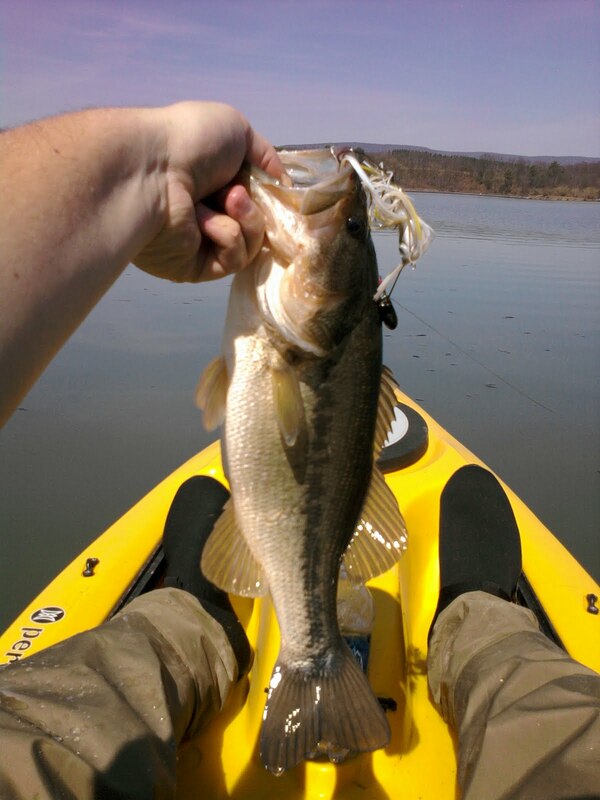 The largest bass came on a Strike King spinner bait, and the next two came on soft plastics...one on a tube and the other on a wackey rigged senko. The trout also came on the senko, which I did not expect, lol... I think the headwaters of the lake must be stocked with trout, and the fiesty little brookie got swept down into the lake with the recent high waters. While we are on the subject of stocked trout, I'd like to close this blog entry with a reminder about the rapidly approaching opening day/s of PA trout season. This coming saturday (April 3rd) is the opening day for several counties in the southern/southeastern part of the state... including the county in which I reside--Juniate County. The remainder of the state will then open up for trout fishing on Saturday April 17th. Here in central PA it is possible for some confusion to exist about where fishing is open and where it is not during the next couple of weeks. If you are concerned about the area or areas you are planning to fish, here is a link to the fish commission website regarding season dates and stream openings. If you are heading out sometime in the next couple of weeks, good luck... and don't forget that this is a great time to get your children, or your family members--cousins, nieces, and nephews--interested in fishing. Until next time... thanks for reading and good luck on the water.